The ongoing war in Yemen has transformed into a humanitarian catastrophe of unknown magnitude. Civilian casualties, estimated in the millions, continue to rise as do the number facing severe famine. Saudi Arabia and other parties to the Yemeni conflict stand accused of repeatedly violating international humanitarian law. In spite of these allegations, countries continue to export weapons and military equipment to Saudi Arabia, in what seems to be a direct violation of the terms of the Arms Trade Treaty (ATT). 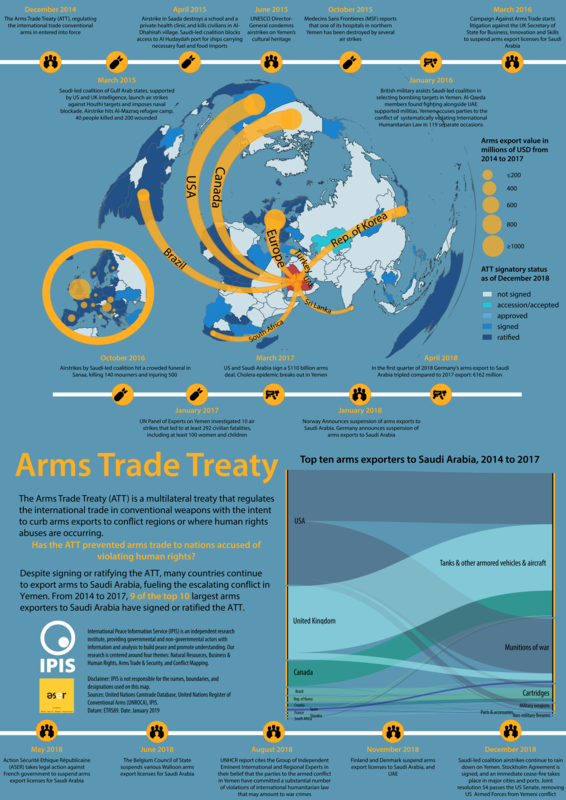 This infographic depicts the world’s largest arms exporters to Saudi Arabia, their relationship to the ATT, and the escalating violence in Yemen.